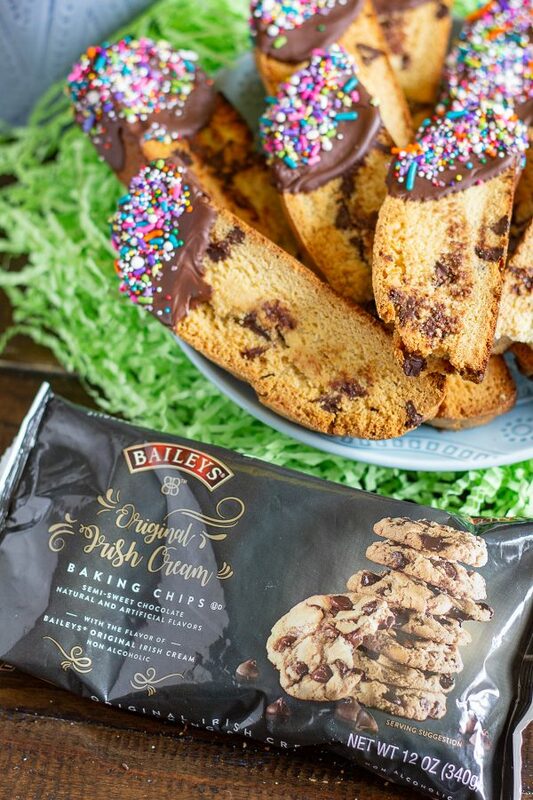 Biscotti with BAILEYS® Baking Chips is a slightly sweet treat to add to your Easter menu. The active preparation time for this recipe is just 30 minutes and it is so easy that anyone can successfully prepare it. This biscotti recipe starts with a simple vanilla flavored biscotti. Then you add BAILEYS® Baking Chips. 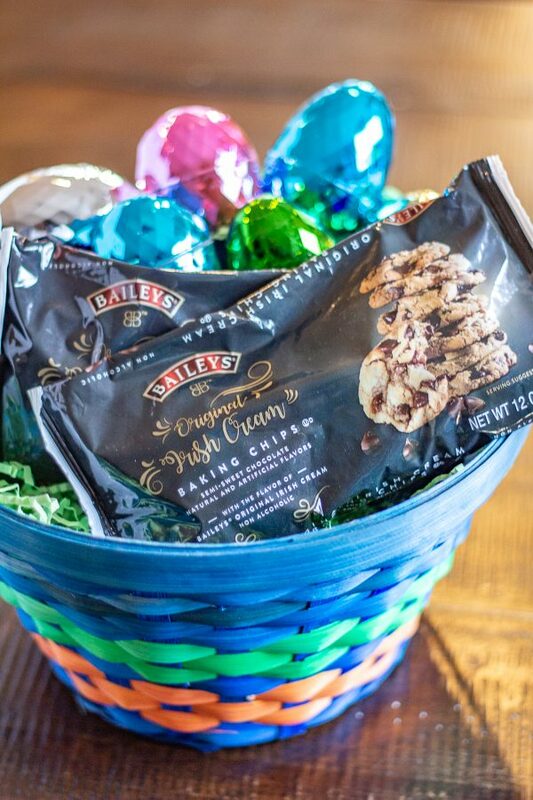 BAILEYS® Baking Chips have the smooth taste of BAILEYS® Irish Cream Liqueur, but without the alcohol, and with the addition of semi-sweet chocolate. 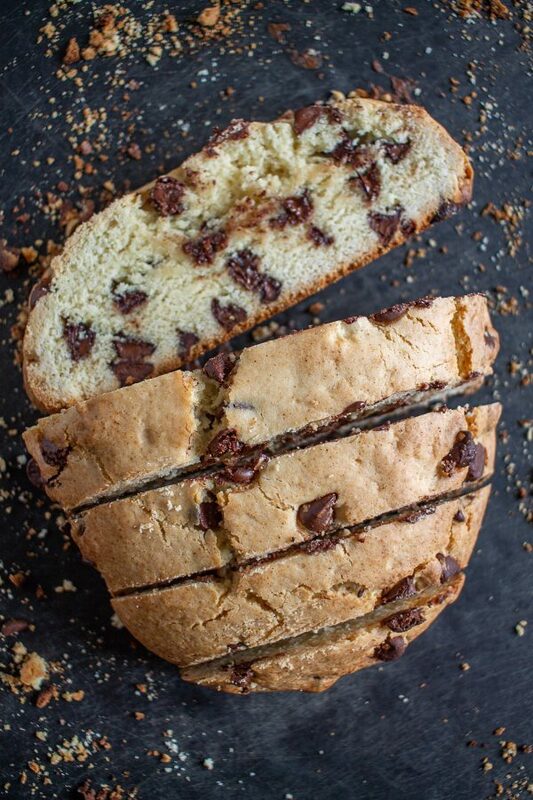 The baking chips capture the richness of Irish Cream Liqueur and semi-sweet chocolate to give the biscotti a new dimension of flavor. 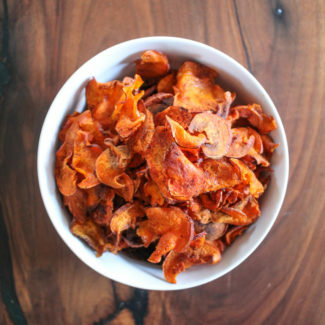 The baking chips can be used in recipes just like chocolate chips! Adding the BAILEYS® Baking Chips to biscotti is an easy way to dress up a classic recipe. You might think of biscotti as something to get at a café and not something to make at home, but homemade biscotti is crispy and crunchy without being too hard. Biscotti tastes best when it is homemade and fresh. Making biscotti from scratch is easy, and the recipe relies on pantry staples you might have on hand already. 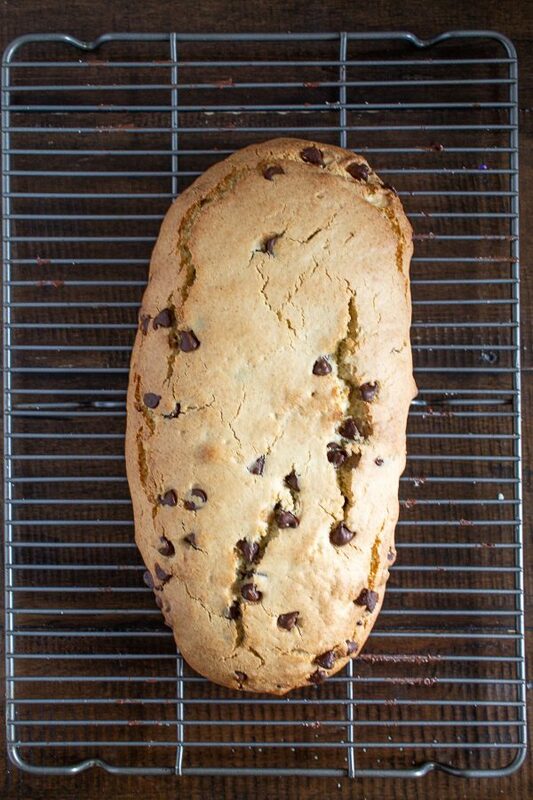 The biscotti dough gets mixed up in an electric mixer, then you turn the dough out onto a lined baking sheet and form the dough into a long flat log. After about 25 minutes of baking the log of biscotti will be golden brown. Let it cool until it can be handled, then slice the biscotti. Return the biscotti to the oven for about 15 minutes so that the slices can brown. 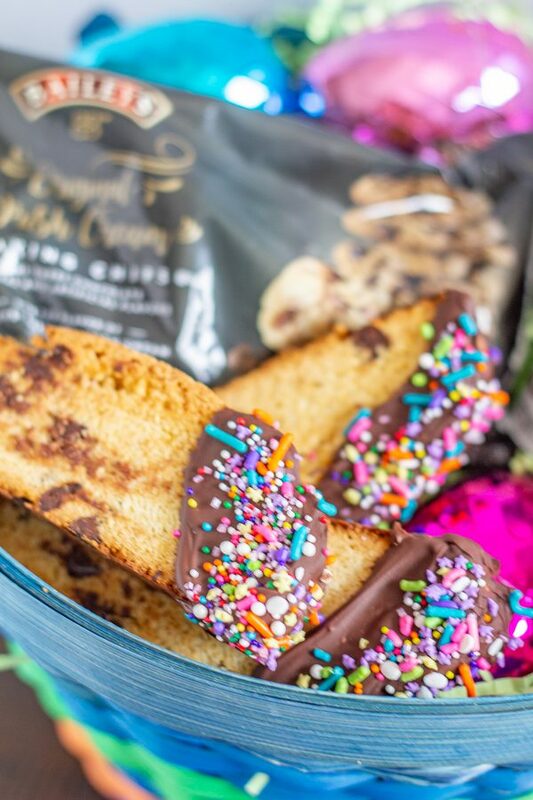 To add a festive touch for Easter, I dipped the biscotti in some melted BAILEYS® Baking Chips and then added pastel colored sprinkles. Melting the BAILEYS® Baking Chips in a double boiler is easy, and the chips are much easier to melt than chocolate chips. 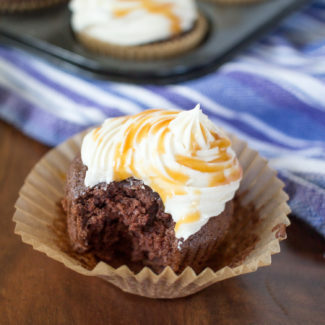 They melt into a smooth chocolate that is easy to work with. 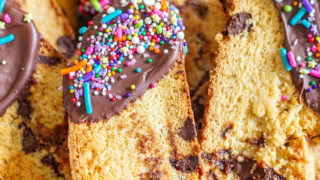 Once I spread some chocolate onto the biscotti I added some sprinkles and then I let the biscotti sit until the melted BAILEYS® Baking Chips had set. 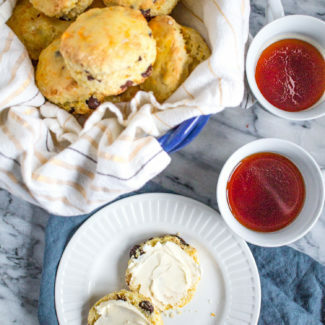 The biscotti is best served alongside coffee or hot chocolate. When you dip the biscotti into a hot drink the BAILEYS® Baking Chips will melt giving your beverage an extra flavor boost. 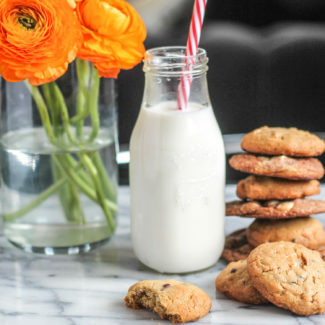 Plus, the crunchy biscotti soaks up coffee and hot chocolate – it’s even better than dunking a cookie in milk! You can find BAILEYS® baking chips at WalMart.com, and starting in August, in Walmart stores nationwide. It’s an ingredient that you might want to keep stocked in your pantry – especially since it melts so well! 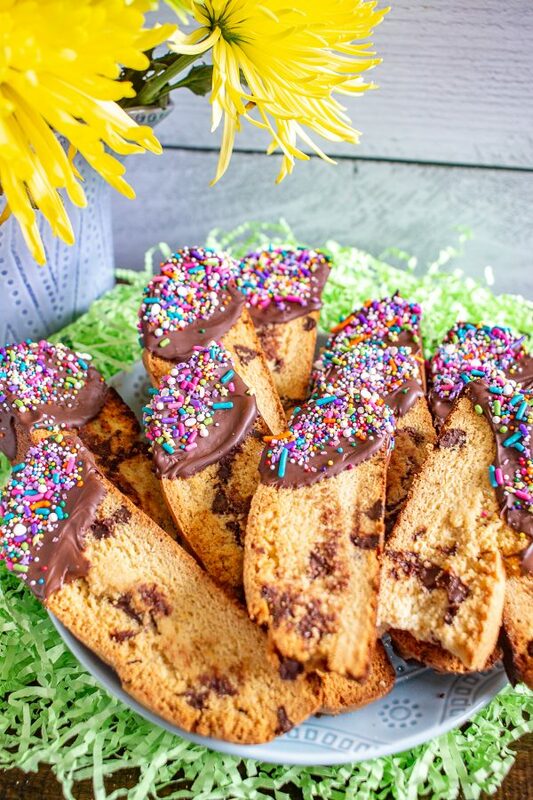 Biscotti is so easy to make and it's an elegant addition to an Easter Brunch. 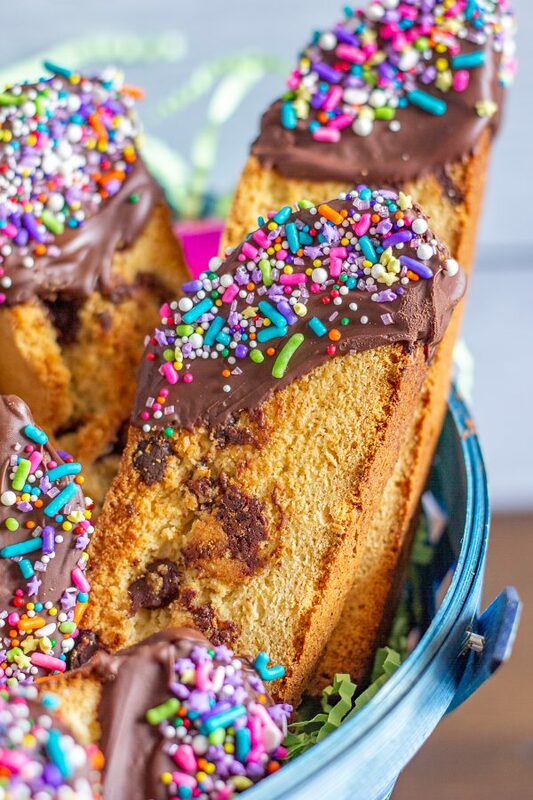 This biscotti is made with BAILEYS® Baking Chips, and dipped in sprinkles for a festive colorful touch! In the bowl of an electric mixer, combine the vegetable oil, sugar, eggs, and vanilla extract. Beat together on a medium speed until evenly combined. Next add the baking powder and the flour. Beat together on low until evenly combined. You want the dough to be thick and not overly sticky. Stir in ¾ cup of the BAILEYS® Baking Chips. Turn the dough out onto a baking sheet lined with parchment or a silicone pad. Use your hands for form the dough into a long flat log. Bake the biscotti at 375 degrees for 25-30 minutes, until the biscotti has browned. Then place on a cooling rack and let cool enough so that you can handle it. Once the log of biscotti has cooled, use a sharp serrated knife to cut the biscotti into slices about ½ of an inch thick. 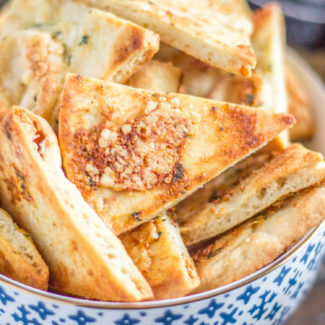 Arrange the slices of biscotti on a baking sheet and then return them to the oven at 375 degrees to toast them. Toast the slices of biscotti until golden brown, then flip the slices and brown the second side. 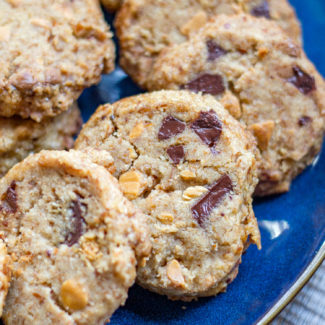 To add the melted BAILEYS® Baking Chips, first melt the baking chips over a double boiler. Find a saucepan and a heat safe glass bowl that will fit over the saucepan. Fill the saucepan with about 4 inches of water, then heat the water until it starts to steam. You want the water to be steadily steaming but not boiling. Once the water is steaming, place the glass bowl over the water and add the BAILEYS® Baking Chips. Stir until the baking chips have melted. 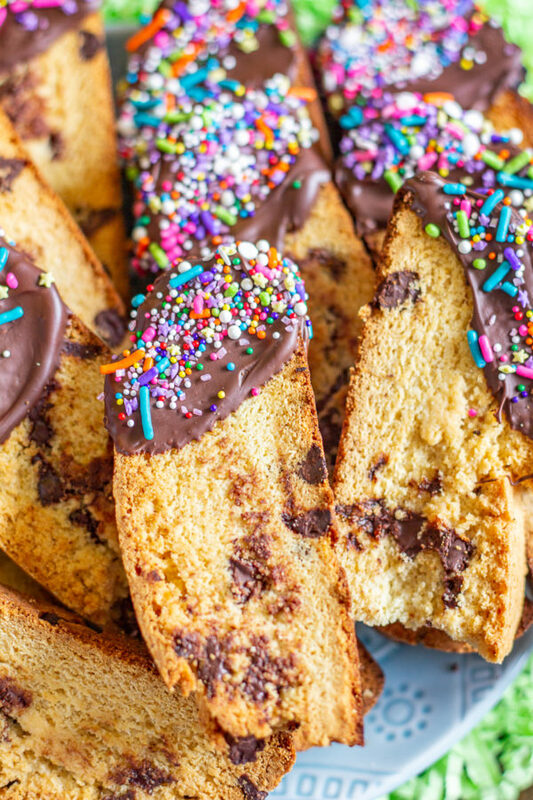 Use a spoon to help spread the melted baking chips over the biscotti, then immediately add sprinkles. Continue coating all of the biscotti. Let the biscotti sit on a cooling rack until the baking chips have hardened again. This post was sponsored by Clabber Girl; the opinions expressed are my own. 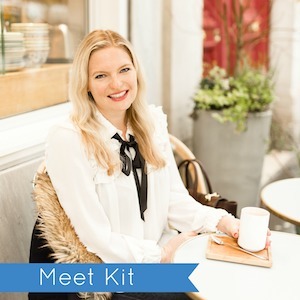 Thank you for supporting the brands that make The Kittchen possible.